[Episcopal News Service] Politics and religion. They’re the topics you’re not supposed to talk about, if you want to avoid a conversation filled with fireworks. But in today’s intensely polarized political climate, where policy debates often hinge on values and on how each side views the role of government in Americans’ lives, those debates are being influenced by people speaking out as Christians, from evangelicals to Episcopalians and including Pope Francis. Episcopal involvement in political causes and demonstrations has grown over the last eight months. Episcopalians joined millions across the country Jan. 21 for the Women’s March and related demonstrations. 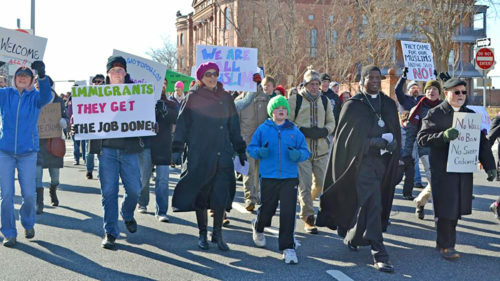 Several hundred joined a March for Refugees on Feb. 4 in Baltimore, one of several cities that hosted similar marches. And on March 10, Episcopal leaders will join with activists in Washington, D.C., for a march in support of the Standing Rock Sioux Tribe in its fight against a North Dakota oil pipeline that the tribe says threatens its drinking water and treaty lands. In more progressive Episcopal congregations, talk of a church-led “Jesus Movement” may coincide with continuing political activism. But not everyone thinks protests and other forms of activism naturally or easily flow from Jesus, church history and theology. Anderson said he still thinks protests can be a worthwhile way to make common cause with others, to draw attention to issues and to satisfy our “desire not to passively acquiesce to things that we think are unjust,” and he personally is sympathetic to some of the arguments being raised nationally by recent political protests. But he’s wary of mixing Christian teachings with political messages. It risks blurring the meaning of those teachings, Anderson said. If we as Christians indiscriminately attach to political protests, we may lose sight of “what is distinctly and uniquely Christian” about our political activism, such as Jesus’ teachings in the Sermon on the Mount and the Beatitudes. Can protest be a righteous expression of one’s faith? On the Christian journey, is there a risk in engaging too deeply with the secular realm? How do we know when it is it appropriate to speak out in the name of Jesus? Diverse congregations across the United States are wrestling with these questions. That diversity in the Church is part of what appeals to the Rev. Noelle York-Simmons, rector at Christ Church Alexandria. “You can find a place that answers your spiritual and/or political and/or theological and/or social needs,” she said. York-Simmons saw the “ethos” of her parish at work in the vestry’s decision in early February to release a statement opposing white supremacy, a response to an uproar in Alexandria after a prominent white nationalist, Richard Spencer, moved to the neighborhood and set up shop. From left, David Hoover, William Roberts and the Rev. Heather VanDeventer represent Christ Church Alexandria at a protest Jan. 29 outside a townhouse where white nationalist Richard Spencer recently set up shop. Some members of the congregation also have joined in peaceful demonstrations outside Spencer’s new headquarters, and the congregation occasionally has helped mobilize members to protest. Their message: “Our city and our neighborhood are not places that are going to quietly allow that kind of hatred to fester and live in our area,” York-Simmons said. She sees this kind of activism as part of being a Christian, not contrary to it. “If we are going to follow our baptismal vows, then we are by nature going to occasionally need to stand up against injustices that we see,” she said. Our answers to those questions need to be distinctively shaped by who we are as Christians, he said, and spirituality also needs to shape the means we use to work toward those ends. Bader-Saye pointed to Martin Luther King Jr.’s adherence to nonviolent protest as an example of a tactic informed by his Christian faith. Since President Donald Trump’s election, Bader-Saye sees even more reason for Episcopalians to speak out on the issues of the day, as they and the Episcopal Church test the urgency of this moment for spiritual and political engagement. “Right now, I feel like if a gathering of the church doesn’t feel like an act of resistance, we’re doing something wrong,” he said. There is no shortage of examples recently of political issues taken up by the Episcopal Church: refugee resettlement, immigration, Standing Rock, health care reform – even whether the U.S. should move its embassy in Israel to Jerusalem, which the Episcopal Public Policy Network opposed in a policy alert on Feb. 14. What Bader-Saye calls “corporate protest,” as opposed to individual Episcopalians’ political activity, is guided by the resolutions passed by General Convention. It falls to the presiding bishop, the president of the House of Deputies and Executive Council to determine how such guidance should inform the Church’s stance on the issues of the day. In one recent example, Presiding Bishop Michael Curry and House of Deputies President the Rev. Gay Clark Jennings were the lead signers on an amicus brief filed March 2 by 1,800 clergy and religious leaders in a U.S. Supreme Court case involving transgender-bathroom use policies. The court on March 6 said it wouldn’t hear the case, a setback for the transgender teen whom Curry and Jennings were supporting. The Rev. Michael Battle, professor of church and society at General Theological Seminary, sees recent examples of Episcopal activism as part of a profound change in the church since it first came to America in the Colonial era. “The Episcopal Church has moved from the church of the establishment to a church of advocacy,” he said, identifying 2003 and the ordination of the church’s first gay bishop, Gene Robinson, as one key pivot point. As the church’s perspective changes, from one of power to advocating for the powerless, Battle sees parallels with the black church as an institution serving the oppressed. “If you’re part of the groups that are being victimized and are not in power, then there’s a whole other way of understanding church,” Battle said. Battle was influenced by his time serving in South Africa with Archbishop Desmond Tutu in the early 1990s. Tutu was politically vocal in opposing apartheid, but Battle said he also displayed a deep Christianity that informed all he did in the public sphere. “He always said his prayers every day. He always had habits that kept him grounded in Jesus,” he said. Battle thinks a lot of activism lacks that kind of spiritual depth, which can fuel it beyond this or that protest. Using that spiritual depth as a source for the Church’s actions in the world is at the forefront of what Curry sees as the Jesus Movement, and he has not shied away from political and social issues. In September, he visited the site of the Standing Rock protests in North Dakota to show the Episcopal Church’s solidarity with the tribe, out of a Christian calling to stand up for human dignity and environmental justice. Episcopalians have been on the front lines of demonstrations there since August. Christian values also have brought depth to Bishops United Against Gun Violence, a group of 80 Episcopal bishops that has taken root and continues to pursue its mission years after it was formed in the aftermath of the December 2012 school massacre in Newtown, Connecticut, and other high-profile shootings. The Rev. Jim Curry was bishop suffragan in the Diocese of Connecticut at the time of the Newtown shooting. He and two other bishops in the diocese wanted to do something that would invite Christians to a ministry of prayer while also bearing public witness on the issue of gun violence. They organized a Way of the Cross walk through the heart of Washington, D.C., in March 2013 during Holy Week, adding contemporary meaning to the traditional re-enactment of Jesus’ journey to Calvary and the tomb. The procession was joined by about 400 Episcopalians, including 30 bishops. Christian activism also has prompted differing opinions on how political Jesus was. Biblical and theological scholars tend to agree he was a political figure, though “politics” in Jesus’ time meant something totally different from what it means today. Jesus’ words and actions could be seen as political, though, he said, in how they brought him into conflict with the powers of his time, as seen in his journey into Jerusalem at the end of his life. Bader-Saye sees that journey as analogous to some of the great protest marches of our time, from the civil rights march from Selma to Montgomery in 1965 to the Women’s March this year. “Jesus was intentionally taking his witness and his proclamation to the place that it was going to be heard by people in power,” he said. But Anderson, the Nashotah House professor, cautions politically active Christians not to expect Jesus to provide precise spiritual justification for present-day political causes. “Jesus as we know him in the scriptures becomes like a talisman for causes we’re already committed to,” Anderson said, but by reading socio-political implications into his teachings we may be clouding his meaning with partisan baggage. “Sometimes Christian engagement in political affairs actualyl misshapes the distinctively Christian character toward our desired political ends,” he said. “Engaging on the level of the values and the commitments that we hold dear, which are going to come from Jesus of Nazareth and our tradition as Episcopal Anglican Christians … that value-based engagement is not just an interest group,” Curry said. Addressing the church’s activism on the issues of refugee resettlement and immigration, Curry invoked Jesus’ parable of the Good Samaritan in expanding the meaning of “love thy neighbor” and encouraging America to welcome strangers from other countries who need our help. “You see, that’s not an issue; that’s a value. Then you engage refugees and immigration policy, not from the issue but from the values of Jesus,” he said. York-Simmons said she personally favors even more political engagement by Episcopal congregations, but she wouldn’t expect that from all congregations. Serving the less fortunate can take a variety of forms, and more traditional congregations may carry out their baptismal covenant in their own ways. – David Paulsen is an editor and reporter for the Episcopal News Service. He can be reached at dpaulsen@episcopalchurch.org. Mary Frances Schjonberg contributed to this report. It’s good to see this report on a needed conversation. I’m a Professed Member of the Order of the Ascension. Recently we decided to have a discussion within the Order rising from the election. The parishes that members are associated with range in their political make up. Some voted 50-50 in the last election; others would have a difficult time finding anyone who would admit to voting for Donald Trump. Members of the Order would probably align themselves with Fr. Kenneth Leech’s understanding of the social vision that emerges from the Anglo Catholic tradition – a cooperative society, materialistic, a transformed society, a rebel tradition. We decided to focus our conversation around how to live the unity of the church within our parishes. We’ve been doing that for over a month now. One part of the exploration has been about how we manage our own emotions and beliefs in a manner that also allows us to respect those we differ with. I would proudly vote for Donald J. Trump. People don’t speak up because zealots like yourself would beat up and bloody us. Go pick up one of those families and assume financial responsibility for them…bet you wouldn’t you hypocrites. I have always been proud to be a priest of a Church that stands for the mission to which Jesus has called us to minister to all of his children. Having been involved in community service, ecumenical relations, and racial reconciliation, I have become aware of the tendency among some to use those noble efforts for less than noble purposes. I believe that we, as clergy and laity, should take to heart the assessment of the British clergy of his day, when as G. K. Chester observed: “Some are so heavenly minded. They are no earthly good! Just sayin’. The problem is not the intent but the method. For example “loving our neighbor,” can take many forms: from relief aid to foreigners in their own country, to throwing our borders open to refugees. The current leadership in the Episcopal church seems to embrace a single method which is often in conflict with the method that many in our congregations may espouse. Then if one is critical of that chosen method, especially in this forum, one is often attacked as not being truly christian or christ-like. I speak from personal experience. As a conservative, and a life-long Episcopalian, the church leadership often does not represent my views and their ongoing march toward progressive activism is just driving me and my fellow conservatives away. Our voices matter too! I agree. We all want a better world, a more Christ-like world. But our church leaders seem to think they can speak for all of us, and I resent “how” they go about it…a “mightier than thou” attitude which deters others from joining us, most particularly in rural areas. Why we cannot just live as Christ would have us do…in love and caring for all sorts and conditions of men/women/children/animals/earth/sky/and sea….allowing our witness to be how we live, love and embrace….instead of marching, and jumping on every band wagon that comes along….is a mystery to me. I am both liberal and conservative, depending on the topic…..but as I have said, I resent our leaders speaking for me. They are too politically involved, and always have been. Having said that, I adore my church. I, too, agree. I have seen in this part of the country those who feel that activist politics and the church are not a good combination, and this has been schismatic. The product of the schism in many cases has been a new, vibrant congregation with traditional values in liturgy, missions, stewardship and outreach–what I value in the church. Each a do every day , it seems, the heirarchy of what has been my church tells me I am not welcome here . Maybe I should take all of you at your word. If I point out the huge piles of trash the self described environmentalists left behind after protesting DAPL– piles of trash that present a real and immediate threat of contaminating the river you all claim to care about, experience says you will all ignore me . Not to mention the 20 plus dogs they abandoned to live off the garbage and freeze to death. What’s a little garbage and frozen puppies when lofty ideals were involved. Nowhere in this article is there a scintilla of recognition that people who voted for Donald Trump gave any place in any Episcopal church or that they may have views and beliefs that are also based on Christianity. None. Nothing. This is an article that assumes that the only people who count are progressives. It sends a clear message that my kind (Republicans). Are not really welcome here. The message I increasingly get from the Episcopal heirarchy is shut up and write a check. It is a message , perhaps a little modulated, but essentially unchanged, that I don’t count and I am not wanted . I am rekuvtant to leave the church I have called home for thirty years, but I am growing weary of the continual sneering and contempt from the people who are certain that they are smarter and kinder and better and way mire educated and Christian than I am because they support all things progressive. Thank you Susan for you frankness. There are many of us that feel as you do. Thank you, Susan. I completely agree with you. Perhaps we need to form a national group for conservative episcopalians, so that we can stand united and have our opinions considered. I think the leadership would be surprised how many of us there are in the church. I am a center right Episcopalian who believes that this country’s government needs to move away from thinking that the federal level of government should run every show. Our national budget and debt indicate that we’ve gone overboard with that. We need to have some disruption from the status quo and it seems that we are getting it. I am a progressive (i.e. outside the box) thinker. Those who identify themselves as “progressives,” who only align themselves with the Democratic party, keep trying the same approaches to solve problems, try to make them fit all across our enormously vast and varied nation, and then when they don’t work scream that it’s because we haven’t spent enough money on it. What is progressive about that? Are our social programs providing sufficient safety net? Is our national education program elevating the intelligence of our populace? If the answer is no, then I believe it is incumbent to actually change what we are doing and make it better. Protest is fine but as said above, it is a blunt edge sword. What really works are ideas, and leaders who can turn those ideas into action. We need new solutions. Our church is in an excellent position to encourage new solutions. We are out front in proposing new solutions to social issues that face the church. I applaud that. I stand behind that. I believe it is what God would have us do. The Episcopal Church proclaims to welcome all. I consider myself welcome and I don’t hesitate to be inclusive of all, too, regardless of how they vote. I don’t recall anywhere that Jesus suggested that we seek our help from the government. Jesus wants us to seek help from each other. We can’t do that if we can’t even talk to each other. Wasn’t Jesus against Empire? Does the political left in the Episcopal Church believe that our US Empire is somehow different from the Roman one? Democrats believe in national programs, Republicans believe that the federal government should be restrained from too much power. Which one of those ideologies most represents resistance to Empire? Recent letters from our bishops indicate that they clearly expect all Episcopalians to share their political views, and are quite intolerant toward those who do not share their politics. I suppose they are equally intolerant of all the time and money I have devoted to my church over the years. except by handing it on thru the corporate works of mercy ? Susan, I am sorry that you have had the experiences in the parish that you mentioned above. I have always found that the parishes of which I have been a part, welcoming of all political and theological beliefs. There are many ways one may be called to serve Christ. BTW, those persons who left trash and dogs were literally chased out of their encampment by armed guards under the direction of the sheriff. I am sure they had little time to gather their own personal belongings, let alone clean up or to try to corral their pets. John, Susan is talking about the hierarchy of the Church meaning the governing bodies of the church which tax us by assessing our local churches and then spend the money on their leftist political agenda. I belong to a small suburban church where I rarely hear about anything political. Many of my fellow congregants do not realize what a portion of their pledges are being spent on by the church hierarchy. Take a look at the 2016-2018 EDUSA budget to see how much we are paying our church leadership for their leftist political advocacy. As for the Dakota pipeline encampment; the demonstrators had plenty of opportunities to leave and clean up their mess before they did so. They waited until the last minute of the deadline they were given before being driven off by the authorities. The first women’s march in DC was not run off by authorities but you can find pictures on the Internet of the trash and mess they left on the mall if you care to do so. Are you seeing a pattern here? The demonstrators at Dakota did have warning – which was then extended – twice I believe – to leave. Clean up should not even have been necessary had the demonstrators taken pride in their surroundings and environment and daily cleaned their own areas of human waste and household garbage. The cost of the clean up was in the millions of dollars and speaks woefully of the purpose and decorum of people who are so passionate on the one hand about clean water and who are so dismissive of keeping our beautiful country clean and our water drinkable. This encampment was in a flood plane which. on rainy days, drained unspeakable filth to the very river in question. I couldn’t agree more with Susan Salisbury. As a conservative I feel less and less a member of this Church with each passing year. Rev Michael Battle says the Church has moved from a church of the establishment to a church of advocacy. No it hasn’t – it’s moved to a church that embraces leftward -leaning political activism and and the total acceptance of liberal dogma. The only Episcopalians who consider this a “Jesus Movement” are progressive Episcopalians. I rather doubt even Jesus would consider this a Jesus movement! As I’ve said before, I didn’t vote for Trump, but unlike many progressives I am not going to look down on people who did, or question their morality, their decency, or their faith. Protesting outside the house of a white nationalist is easy. Makes you feel morally superior. How about instead knocking at the door and inviting the guy to join you at church next Sunday? You know, loving your enemy and all that? I guess for a progressive that would be too much of a challenge. To me, the fact that they won’t even listen to the concerns of conservatives in their parish is the most insulting. And this includes many, not all, laypeople as well as the clergy. How are you supposed to feel a part of that parish if your opinions are ignored? And I didn’t say agreed with, ignored. John Miller says all the parishes he belonged to welcomed people of all political beliefs. I hope they did, but I can’t help but wonder if he got that impression because he was looking at them through the eyes of a progressive. I can’t help but wonder if the conservative members of those parishes felt the same way. There should be a national dialogue regarding this issue. Each diocese should have a forum in which conservative members of the parishes can express their disagreements and frustrations to their progressive brothers and sisters. On ALL issues, be it immigration, gay rights, climate change, race relations, whatever. I wish someone would bring it up to Bishop Curry. Unfortunately our esteemed PB would probably not have time to consider it. He would probably be too busy at Standing Rock or promoting transgender restrooms. While dialogue, tolerance, and compassion are important from all ideologies, I think some of you are missing who exactly Jesus is: A humble, revolutionary figure that actively challenged the religious/political status-quo of the times and referred to those that didn’t as “hypocrites.” Perhaps instead of criticizing the PB for going to Standing Rock or promoting transgender rights, you might want to review the Gospels a bit more thoughtfully. Sometimes “loving thy neighbor” means embracing sociological/political/religious perspectives and approaches that are in the best macro-universal interest for everyone (yes, that includes EVERYONE — conservatives, moderates, and progressives alike). When I was growing up in the 50’s & 60’s we were taught that a priest is a Holy person appointed by God and every word that came out of his mouth is Gospel. Many of us still feel that way today but some are beginning to question that kind thinking. Priests and Bishops are made and appointed by other men and it seems many of them have been elevated from the Progressive ranks. One of the tactics used by Progressives Christians to justify their position is to use Scripture or interpret Jesus’ actions to fit their agenda. And then, use that to label anyone who disagrees with them with words like heretic, hypocrite, racist, misogynist, xenophobic etc. in an effort to silence the dissenters and bring them back into line. Anyone can find Scripture or interpret Jesus’ actions to justify their position. What you are seeing on this page are comments from those of us who are no longer shamed and reject those labels. This is why many of us are leaving the Episcopal Church. I have looked and looked to find a Christian denomination that is not involved in political lobbying and activism. It seems the only polity that is dedicated to worship is a congregational church. The others like the Episcopal Church have been infiltrated by Progressives who care nothing for any other opinions but their own. If the Episcopal Church Leadership continues on the path is is following the Church will continue to shrink in numbers. I can only pray they wake up but I doubt that will happen. Mr. Louis, if you substituted “conservative” in place of “progressive,” in many of your opinions, you can see the dilemma, especially when many humanistic aspects tend to cloud what Jesus’ intentions truly were/are. Clearly, many so-called conservative religious authorities in many Christian denominations/factions may wish to revisit the Gospels, especially when they advocate for many of the same things that you chastise progressives about…. I grew up in an Episcopal Church in California as an acolyte, on the boy’s choir, and with the Boy Scout Troop. I learned the importance of God and Country, and values of honesty, bravery, respect for the law, community service, support for the rights of others, and compassion for the less fortunate. At school, civics class taught us separation of church and state, and science taught us how the world worked. At Church, we learned the difference between right and wrong and how we should live our lives. I have been blessed with good health, a loving family, financial success, and I live in the greatest country on earth. I give my time and money to church and charity, but probably not as much as i should. I am no fan of President Trump, the man, but I do agree with many (not all) of his political positions and executive orders. I have joined the ranks of the disaffected members who have left the Episcopal Church. Why? Betrayal. Betrayal of the fundamental values that I learned as a young boy and that have served me well. I cannot be a member of a church that dismisses conservative dissenters as hate-mongers and racists, and whose leaders suggests that only those who think the way they do can be good Christians. I support the right of all persons to protest and voice their political and social opinions, but I am offended when the Church claims to speak as one voice for me and funds its political agenda with pledge money and mission shares from members who disagree with its leftist messages. I’m not qualified to debate with the commentators in the article on the difference between fundamental verses new age interpretations of the New Testament. It is clear that Church leadership has adopted a leftist agenda as “God’s work,” and cloaks its message with buzz words like “dignity,” “social justice,” and a new one to me: “environmental justice”–an agenda that is one-sided and smacks of political slogans taken from the DNC manual. There is an ever-present danger for both liberal and orthodox churches when its leaders advocate political positions purporting to speak for God, or say that their political positions are God’s “moral” positions, because those who disagree will leave. This article itself must have been conceived as an effort to explain or justify the post-election “advocacy” of the Church in the face of a declining membership and a growing backlash by those who philosophically disagree. But when I read the article carefully, it merely demonstrates that those quoted who are advocating protest and resistance don’t want dialogue and reconciliation because they have no middle ground—their version of inclusiveness and dialogue is to loudly advocate their political positions as unassailably correct until those who disagree stop listening or leave. We must all kneel at their altar of political correctness–no guns, no oil pipelines, no deportations, open borders, one world order, and communal locker rooms and showers for all. The excommunication of the conservative members means the Church ultimately becomes a left-wing club where everyone is drinking the same flavored Kool-Aid. i have found a new place of worship that is not embroiled in internal and external political warfare: a place where we can again go home after church, enlightened and uplifted, rather than angry and frustrated. We have found a church that is a place where we put aside politics and personal differences, and where we socialize and welcome each other on the common bond that we all believe in God and Jesus Christ, and where we celebrate our blessings. Mike I have three words for your comments: AMEN, AMEN and AMEN! I agree with the Conservatives above and have only one more thing to add to the comments… Did those in opposition to our President and this administration ever think that God is saying enough already !! That it’s God’s Will and He supports our President? Did you ask God? In Church we should never be considered Republicans or Democrats / Conservatives or Liberals . A shame it has come to this. I too am deeply troubled by the recent dramatic shift of the Episcopal Church to the left. I am amazed that these progressives would invoke the position if Pope Francis as justification for their position. I thought that was settled some centuries ago. One can find a portion of scripture to support any cause they have. As a Rockefeller Republican, I am now a pariah within this faith. However, there is nothing evil, sinister, hateful or inherently wrong with my views. Since the 1970s when I became an Episcopalian, I have seen the church expand beyond religion and become increasingly involved in social issues. It has now developed to the point that I do not feel I am a complete Episcopalian because I do not embrace all the social causes of the church. Specifically, I have difficulty with the knee-jerk reaction against corporations, Israel, climate and the environment. The outlook I share is embodied by the six folks who have written ahead of me: Susan, Betty, Ralph, Terry, Bill and Mike. I am curious about the word “progressive” used in many of the above messages. Another word that pops up is “values”. If feeding the hungry and clothing folks, by means of a true living wage then perhaps we are in agreement. If following the Great Commandment to love God, neighbors and self without judging our neighbors, then perhaps we are in agreement. The words “progressive, regressive, conservative” or any other “ive” are words uttered by political pundits and have worked into the daily bread dished up news services. I agree with Mike and the others and I am at a loss as to why the Episcopal Church is heading in this current “political” direction. I joined my church to worship. It is “my” church too! The Lords word unites. That is the primary mission of religion, to speak the Lords word, reflect upon it, and to unite. We are all a part of Gods family. Church should be a place to come and to be uplifted…to be renewed. Politics only divide. The old expression, “Divide and Conquer” is so true. It sickens me that the Episcopal “leaders” are promoting division among us by involving my church in politics as if they were speaking for God! Politics, causes, and social issues have no place in religion. I don’t have a problem with advocacy, or making voices known. I do have a problem that it seems that when the far left anarchist groups gripe (with mainly paid media-ready protesters) then the Episcopal Church’s leadership dashes to be alongside with vestments and flags flying. First it was Occupy Wall Street, then Black Lives Matter, then the Women’s March with its insane ranting and mountains of litter left behind. Then there was the Pipeline advocacy standing alongside protesters who created an environmental mess as they left tons of garbage, abandoned vehicles, and countless dogs behind to starve. All of these protest groups have been funded by George Soros and his allies, all taking their cues from the playbook “Rules for Radicals” by Saul Alinsky. Alinsky dedicated his book thusly: “Lest we forget at least an over the shoulder acknowledgement of the very first radical…who rebelled against the establishment and did it so effectively that he at least won his own kingdom – Lucifer.” In each of these scenarios there was the Episcopal Church standing shoulder to shoulder with bought and paid for anarchists. Jesus didn’t protest alongside howling crowds. He didn’t agitate and threaten and all of the other “in your face” tantrums and tactics so widely admired today. He was subtle and invited himself to meet and attempt to persuade. If we are the “Jesus Movement” – and not the Alinsky Movement – then our skills of respect, persuasion, understanding, and meaningful education will be our standard. Signs and chants are easy. Respect, persuasion, and relationships are the real work. Again, it’s vital to see voices from all perspectives converse about these issues, especially those pertaining to religious and social issues. However, like it or not, despite the best of common sense intentions by our Founders (Sam Adams was considered to be the most pious and devout Christian among them, and even he strongly advocated for girls to be allowed the same educational standards as boys), religion does intertwine with politics and social issues especially. In regards to many of the social issues, Jesus rebelled against the social norms of the day, so it appears that many progressives are on the right track there in general (I do agree that sometimes the actions of some complicate the intentions of the majority, especially at protests and demonstrations, but the general message should resonate overall). Or, in hindsight, would we be having some of these same concerns if we were posting on this website in the 1950s/1960s regarding Episcopalians marching and protesting alongside our other Christian/Jewish/Muslim brothers and sisters against civil injustice? The answer is yes….history repeats itself…..
Jesus illustrated quite effectively that there are times to be humble, and then there are times when He actively preached to thousands. When they were hungry, He didn’t chastise them but gave a simple command: To feed them. If some of these demonstrations and protests can “feed” the nation against many of the evil aspects that the Trump brand has instigated, then so be it. I don’t think we who disagree with the actions of the Church should demonize or denounce the Church leaders and pastors in the same way that some in the Church demonize President Trump with defamatory pejoratives or exorcise his name from the Prayers of the People. (Peter, Chapter 1, Verses 13—17—“Honor the Emperor.”) They are good and honest people. We can respectfully disagree with religious leaders and political leaders without the vitriolic name-calling spewed daily by the national media. The discussion here is not who is right and who is wrong on the political issues of our day. There are plenty of secular organizations that advocate these issues, and they are better equipped and funded. The topic of the article is whether the Church should advocate one side of a political debate as the official position of the ECUSA, and the consequences to the Church as a whole when its leaders do so. The Church Leadership has chosen to be proactive advocates on what I describe as the “leftist” view on many controversial secular issues. The Leadership has done so based upon a corporate mandate to support “social justice” politics, and its actions have resulted in disharmony in a membership of diverse political views. Perhaps the article may have been written as an attempt to justify the actions of the Church Leadership. Perhaps it was written as a result of surprise and consternation by local pastors when these actions have resulted in empty pews, a drop in pledge money, and the criticism that politics and religion are a bad mix. What members and pastors do individually and on their own time and with their own personal money is their right. The objection is not that the Bishop and pastors are wrong on every secular issue or wrong in participating in protests —the objection is that they fly the flag of the Episcopal Church and use Church money and their positions of authority to artificially inflate the importance of their opinions by claiming to speak for God and all one million plus members of the Church, when they do not. I am no longer an Episcopalian so the future course of the Church is only a passing diversion. But remaining members might ask their pastors to consider that when the national Church or leaders of a local Diocese adopt and advocate one side of a divisive political debate, and announce that this is God’s word and the official Church position, dissenting members will exercise their right to object to the misuse of authority and pledge monies for political positions that run counter to their own political beliefs. Political advocacy in the name of religion leaves no room for unity or reconciliation because an official resolution by the Church that Jesus is on “our side” erects an uncompromising coat of armor that renders the advocate impervious to and incapable of considering the opinions or arguments of those who disagree. This results in the dissenting members having no voice and no option but to leave the Church. I am unpersuaded that Jesus was a political activist. Yes, he profoundly changed the course of history and our lives, but I missed the chapter where he organized an army of protestors, encouraged riots, or engaged in organized resistance to the Roman conquerors. I can only speculate, but I suspect that Jesus might tell the Church leadership that on the earthly matters facing us today, they should lead by example rather than by the bullhorn. In plain language, here’s the dilemma we face as conservative Christians. I suspect like me, most of us are happy with their local Church, Our rector is a fine person who leads us in worship without political undertones. Our church is welcoming and we care for and do good works in our local community. The issue begins with the Diocese. Like all Episcopal Churches we support the Diocese with a portion of our contributions. There are 99 Diocese domestically and those 99 report up through the Episcopal Diocese of the USA (EDUSA). The Episcopal hierarchy, like the Federal Government, is a bloated organization that exists on the backs of the 6122 churches it governs and it has become infiltrated with leftists over the years. To illustrate, the EDUSA payroll alone is $67M for the years 2016-2018. Imagine what the 6122 churches could do with that money. If your church does not agree with the political activism of Diocese and decides not to pay up, the Diocese will oust your priest, gobble up your Church’s realestate and confiscate your churche’s bank accounts. There are many accounts of where this has happened. So, if we love our local church and rector we will either continue to pay up and learn to live with the Dioceses leftist policies or or leave and find a nice little congregational church somewhere. It’s unlikely we will ever see a change in church leadership that will take us back to where we used to be. If we stay under the leadership of the EDUSA we must learn to live with supporting unfettered immigration, climate change, issues of who can use what bathroom and encouragement to be involved in just about every left leaning political issue. The only other choice is to leave the Episcopal Church. Many of us are doing just that. This is a fascinating conversation! I agree with many of the objections, and disagree with as many others. I’ve always thought that government in general was a good avenue to help those in need (born in 1953, with most of the Roosevelt programs still in place and the “great society” growing; civil rights, the Beatles, gay and lesbian friends; parents whose families struggled and scrimped and hurt all through the Great Depression; a dad who saw the ovens still warm in Germany…). Government programs helped rural electrification and rural plumbing, put my dad through college, helped pay my way through college, fed me when I was unemployed, cleaned up the water and the air, put satellites in orbit for weather forecasting and communications, built roads, sponsored scientific research, cemented diplomatic relations with former enemies and strengthened relationships with friends, and on an on. We would not be the country we are today with government. BUT government also engaged in illegal wars, coups, and sponsored autocratic crackdowns on social groups and political foes of “friendly governments”, engaged in redlining so minorities could not get mortgages, failed to enforce fair housing laws and standards, provided major tax breaks to more and more corporations, enabled the out-placement of jobs, cut back support for schools, NEVER solved the healthcare crisis (although adding some 20 million people to insurance pools has helped; the real problem is healthcare is run by corporations and not medical people). So my sense of government is that it is a mixed blessing. I am an Episcopal priest (3rd career, after law and diplomacy), in a small city in the midwest – a red state. Most but definitely not all of our parishioners voted blue; and most but not all do not believe that street protest is the best way to change the world for the better – although several protested when the KKK came. And we picked up our trash! (The women’s marchers in DC were told to place their banners and signs in specific locations; they had arranged with the city of Washington for trash pickup; the pictures do not tell the whole story; we made other arrangements here and there was no trash). I preach “Love God, love neighbor.” We do feel that it is an important part of our Christian witness to respond to the needs of those on the margins – the “widows, orphans, and aliens” that the Scriptures do harp on about – not only counseling individual believers but rulers as well. I understand the feeling – and I tend to agree with it – that the personal touch lends superior results – that a one-size-fits-all government program may fit many, even most, but will never fit all. I understand the feeling that it is better to address the problems of hunger, homelessness, drug addiction in community – and that means local. But we still need resources, and even with something like 30 churches in our town, the churches can’t do it alone. So we work together with other social-service organizations – both governmental and non-governmental, and provide funds toward the cooperative ventures, volunteer with the NGOs, and advocate for those in need. Please don’t leave the church if you feel your views and values are under question. Instead, engage those who question, and try to understand what they fear and what they desire, and why. This advice goes BOTH WAYS. If we do not have the personal connections, we can’t resolve our assumptions, we can’t learn, and we can’t grow in love. Sometimes the Church forgets about the multicolored robe of the Hebrew text. It caused divisions between brothers that lead to the salvation of a nation. The Church struggles in this life to find meaning and purpose which may only be realized in salvation itself. I am theologically moderate, socially liberal and fiscally conservative. If I can do it anyone should be able to. Peace. Totally agree with Doug . There are many of us that do not agree with the “Soros/Alinsky” mentality and the Church will lose many people an donations. The left has created its own mythological Jesus in their own image. This new, counterfeit, leftist Jesus is no longer the atoning, reconciling Messiah but merely an archetype for “progressive” social action. The “Jesus Movement” as espoused by our leadership is simply secular socialism in action. With all the “high-minded” discussions revolving around leftist goals, the forgotten people in this picture are the babies who are routinely killed in the womb. Episcopalians need not feel too proud of themselves for wearing “pussyhats” and marching for Planned Parenthood’s empire of death.